Wile E Fox is a bay black/true black proven herdsire with an impressive pedigree. He is the son of one of the most impressive suri dams in the country - Arizona Sage of Sweetbriar Suri Farm. Arizona Sage is a beautiful fawn female that took seven Grand Championships under six different judges. Wile's sire is Sweet Foxfire Jax. An impressive male with six blue ribbons to his credit. Wile exhibits very lustrous fiber that locks to the skin with great coverage all the way down his legs. 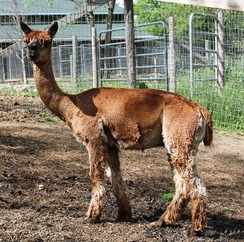 Wile settled his first female at the tender age of two and has several cria on the ground ranging in color from beige to true black. Hollyhock came from Evelyn Brumwell at YB Normals farms where she attracted attention to her well defined locks that glistened and swayed as she ran. Hollyhock was bought by a Michigan farm, and went on to win Color Champion at the 2007 AOBA National Show. Butch has luxurious pencil locks in a beautiful medium brown. His silky locks are consistent from head to tail with excellent regrowth. The judges all described him as having the qualities desired in an excellent future herd sire. 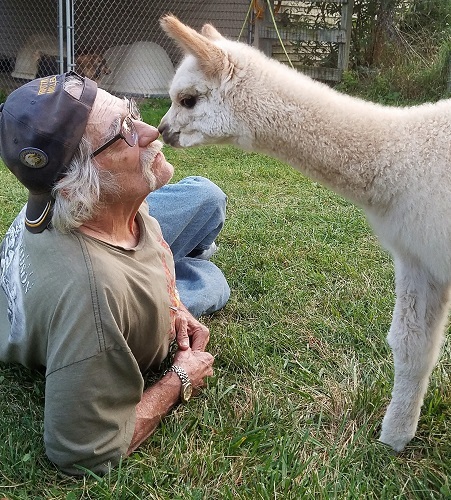 Butch displays a friendly personality and is easy to handle, gets along well with other males in the herd. He carries many desirable traits for producing quality cria, proven by the female crias born on our farm in 2014. 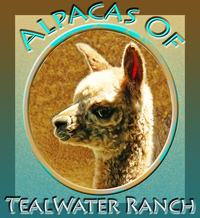 In 2013 Butch easily settled two of our best suri females, Tealwater Amber Lynn and WWR Cinco De Mayo - each gave birth to a beautiful female cria in July/August 2014. These half-sisters are perfectly balanced, vigorous, with silky pencil locks at just a few months old - both 2015 show ring prospects. Butch Cassidy is offered for stud service to deliver the traits most prized in Suris - luster and fine, silky locks.